The Independents for Climate Action Now Party is calling for candidates to nominate in the upcoming Federal Election. As well there will no doubt be a plethora of Independent candidates across the board some of whom will be concerned about climate change. What then are suitable qualifications for such candidates? Primarily the candidates should be well-known and if standing for the Senate preferably known nationally or at least appearing regularly in the main stream media of the state in which they are standing. Examples include John Hewson, Tony Windsor and Kerryn Phelps. Standing in the lower house candidates should have a high profile locally* including such assets as making regular media appearances, experience as a local councilor, previous candidature in state or federal election within the same electorate and polling quite well (that is receiving more than 4% of the primary vote); membership and office bearer of one or more local organisations and with a substantial local network. This list can be quite extensive. An example of the latter is Cathy McGowan who won the conservative seat of Indi. She was a former liberal party member and had a widespread and well organised community network. A strong grasp of climate science is also a prerequisite. This does not mean that the candidate should be a scientist or have formal scientific training but understand the basics of the greenhouse effect and be familiar with ideas of popularisers like Tim Flannery. Non-scientists such as journalists may have an advantage by being able to spread their message in easily understandable terms. 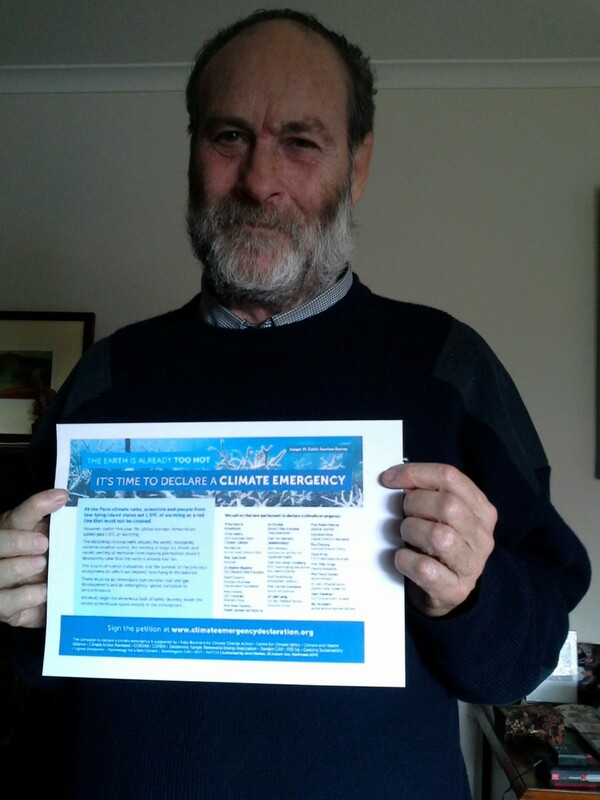 Preferably the candidate should also be a signatory of, or willing to sign, the climate emergency declaration. Other qualifications of some note include the fact that women seem to have done very well in Victorian country electorates and a number polled very well in conservative seats at the recent state election. The candidate ideally should represent the political leanings of their electorate and those formerly members of the Nats and the Libs should be welcomed and supported. They should have a ‘squeaky clean’ record and not be tarnished or stained in any way. And having said all this it should be noted that at least one youthful inexperienced candidate made amazing headway in a conservative seat in the recent Victorian election by dint of hard work and good old fashioned canvassing. Climate change with its threats and solutions – especially jobs in the bush – should be prominent in the promotional material of climate independents. There should be cross party and NGO co-ordination and organization to support these candidates whether part of a formal party or not. We need a large number of candidates speaking out on climate change to help make this election a climate referendum. And hopefully we will have prominent climate independents in both the Monash and Gippsland electorates. *high profile candidates Zali Steggall and Oliver Yates have just announced their candidacy – Steggall will stand in Warringah as a Climate Independent against our climate denier in chief Tony Abbott, and Yates will stand in Kooyong.